The style stuff is all you need for styling your tables. Just use CSS formatted style there and it will be inlined in the generated HTML tag. Alternatively, the admin and the user (the admin in the theme file, the user via BenutzerEinstellungen can extend moin's CSS by his own definitions, so users can refer to them using class or id. You can use several options at the same time by writing them one after the other within the same angle brackets (e.g. 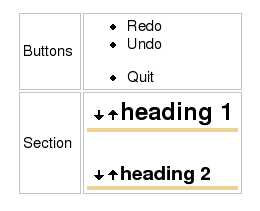 <tablestyle="..." rowstyle="..."> on the first cell, to set both the table-wide style and the first-row style).